This book highlights common and practical themes of daily life and takes you beneath the surface to help you discover their essential virtues. Ryle holds nothing back with his exhortations. When reading Ryle I found myself as a man in a mirror that led me to reflect and repent throughout my reading. May this rare copy of wise thoughts for young men and women challenge you to take captive every thought unto the obedience of Christ. From John Ramos of Billings, Montana on 1/5/2017 . I was a bit surprised on the size of this book and was equally surprised of its potency! The messages contained in this gem are great for both old and young generations. Purchasing multiple copies for graduation gifts will be in the near future. Although it is addressed to the "young men," it is equally important to young women; do not let the classic masculine language deter you. Very good short reads. From Anonymous of Mount Bethel, Pennsylvania on 9/29/2015 . A book that is especially good for young men, reminding them to "remember now your creator in the days of your youth". From Jennifer of Syracuse, New York on 7/22/2015 . Short devotional type chapters are the format of this wisdom laden tome, each chapter focusing on a different aspect of christian life. One of the pithy thoughts presented is that we are not placed upon Earth for the purpose of our pleasure, but rather as a means of training us for eternity. Taking hold of that one gem can greatly influence our response to circumstances we encounter in our lives as well as the choices we make regarding the use of our time, money and talents. 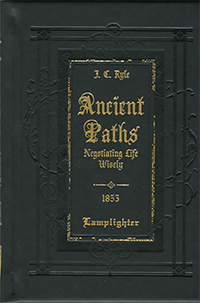 "Ancient Paths" would make a great graduation gift because of the life-changing thoughts that are presented throughout the book. Honestly though, we can each benefit from taking the time to read and ponder the wisdom presented within the pages of this book and apply it to our lives. A real gem! From Richard Heil of Winter Park, Florida on 3/3/2015 . From PAULINE STEPHENSON of TACOMA, Washington on 12/10/2014 . This book is full of timely and wise statements about the way to live life carefully, correctly and successfully.